Forwards divided into 2 groups on one side of the net near the boards. First group with pucks. Defenders near the boards on other side of the net. Goalie in net, if more than one goalie is used alternate every 2nd shot. Players starts when instructor blows whistle. Player 1 skates with puck full speed around cone then enters Zone. 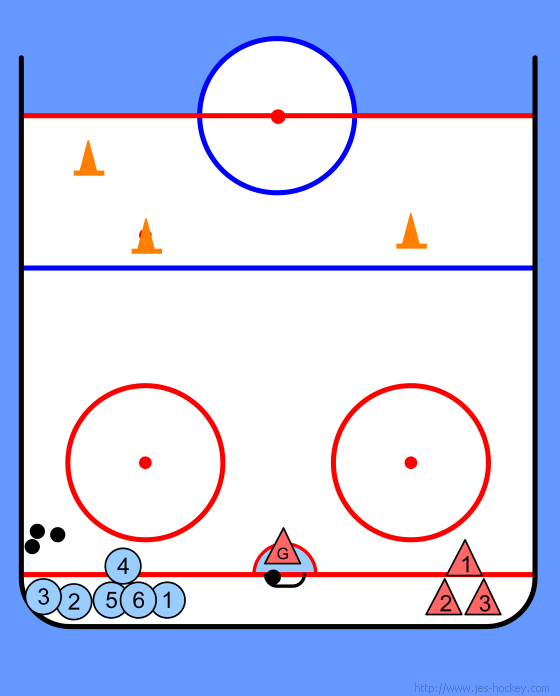 Player 2 skates full speed, around zone and enters zone, being careful of offside. Defender skates full speed around cone then positions to prevent passing between players 1 and 2. Player 1 passes to player 2 and offers a pass option in front of goal. Player 2 skates to overcome defender and get pass. Defender is skating backwards trying to block pass. Player 2 can either shoot on goal. Player 1 is positioned to offer a passing option. Defender must prevent pass between players. Players return to starting positions and next group of players start. Repeat drill for 10 minutes. Tight turns around cones, proper body position, inside skate ahead, weight on both feet. Defender must have proper position between players to block passes he must not commit to puck holder. Change sides after 5 minutes. Players can be encouraged to improvise passing to beat defenders and get shot on goal.